Adding to the controversies over both congressional and presidential impotence was the question about the looming financial default of New York City. For eight months, the nation's most populous city, paying the price for attempting to cope with overwhelming economic and social forces, without budgetary discipline, stood at the brink of economic collapse. Only in later months did it become apparent that the New York predicament merely epitomized the problems faced by the nation's older urban centers. Meanwhile, with default virtually a certainty, those with traditionally rural biases against big-city evils found satisfaction that, at last, the "chickens had come home to roost" because of "misguided liberalism." Ford, the conservative, Middle American president, assumed the support of that constituency and kept his distance from the situation even as harried local officials searched for ways to avoid fiscal disaster. Ford's position was never a mystery. Yet, when he delivered a stern rebuke to the city on 29 October 1975, promising to veto any "bailout" of the nation's premier city, the finality of his statement came as a draconian blow. In one of those journalistic feats that convert a political leader's comments into pungent rhetoric, the New York Daily News reported the president's position with the headline FORD TO CITY: DROP DEAD . The Ford rationale, of course, was simple: only by his display of firmness would the city tidy its financial house. In the days that followed, there was a growing realization that the administration's position had underestimated how much others throughout the country feared the implications of permitting the collapse of New York City. Vice President Rockefeller openly began to suggest that the government might indeed have to play a role. From within the White House itself came similar signals, especially from Treasury Secretary William Simon. 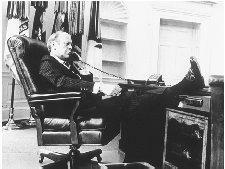 Gerald R. Ford in the Oval Office. Ford's short term was marked by the controversial pardon he gave to President Nixon and the difficult economic circumstances faced by the United States. Ford held to his stern justification that he was forcing New York to restore its own fiscal viability, but at the same time, his retreat had become inevitable. Within the city, frantic negotiations took place involving all parties, including banks that had funded the city's short-term securities. Under the pressure, all interested parties came together during additional weeks of negotiations. Drastic reductions were made in the city's work force. Bankers restructured bond issues. The new Municipal Assistance Corporation was established to sell securities. Union pension funds were committed to their purchase. One near disaster after another was averted in a series of cliff-hanger scenarios. Finally, with the city seemingly acting to repair the damage and the broader consequences of a default becoming clearer, Ford changed his stance when he met the press on 26 November. "I have, quite frankly," he announced, "been surprised that they have come as far as they have." Ford then asked Congress to approve federal loans to the city on a seasonal basis through 30 June 1978. He covered his own retreat by emphasizing that New York had "bailed itself out." Finally, by a narrow margin in the House, Congress approved Ford's request for a seasonal financing act to provide up to $2.3 billion for short-term loans during the next three years at 1 percent above the federal cost of money. To further fortify the city against default, in case that assistance failed to work, additional legislation was enacted to facilitate municipal bankruptcy proceedings so that New York and other cities could adjust repayment of their debts. Ford's position, combined with local and federal measures, induced some painful cutbacks but did start the process of rehabilitating New York's finances. With the coming of the presidential election year, the status of the economy acquired a new urgency. Fortunately, by early 1976, inflation was easing off, and there were tentative signs of recovery, but unemployment would continue to fluctuate throughout the year at undesirably high levels. In his State of the Union message, Ford again urged a slowing down of government spending coupled with incentives for the private sector. "We thought we could transform the country through massive national programs, but often the programs did not work, he said, sounding a theme that became heard more frequently and with varying degrees of stress from Republican critics of the Democratic past. "Too often they only made things worse," he added, and called for a "new realism that is true to the great principles upon which this nation was founded." In the message and in his budget proposal he was clear about his spending priorities: reductions in a variety of social programs, which would be achieved by a consolidation of fifty-nine programs into four block grants, and a "significant increase" in defense spending. While proposing a comprehensive program of catastrophic health insurance for everybody covered by Medicare, he flatly ruled out any action on a comprehensive national health plan and proposed potentially controversial changes in the federal health programs. His budget also aimed to phase out the emergency public service jobs program for the unemployed as well as extended unemployment benefits. Arguing that the money saved would make feasible tax cuts on a "dollar-for-dollar basis," he renewed his 1975 proposals for permanent tax reductions. In short, Ford had prepared the way not only for his own election but to meet any challenge from the GOP right wing. Vice President Rockefeller, the former New York governor, was viewed as a "wayout" liberal, which was, of course, one important indication of the direction of the Republican party. In early summer of 1975, the jettisoning of Rockefeller had already been designed when Howard ("Bo") Callaway of Georgia resigned as secretary of the army to head Ford's election campaign. Callaway lost no time in telling reporters that Rocky was the "number-one problem": "You and I both know that if Rockefeller took himself out it would help with the nomination." When the president met with Rockefeller in the White House on 28 October 1975, only days after the vice president had hinted that something might yet be worked out for New York City, what Rockefeller heard could hardly have been surprising. "I didn't take myself off the ticket, you know," he told Robert Hartmann. "You know—he asked me to do it." Only a few days later, Rockefeller found ample confirmation of his suspicion that he had been sacrificed as part of a grander design. Rocky, and just about everybody else, was convinced that the real architect of the plan was Donald Rumsfeld. Rumsfeld was a Nixon holdover, a not unusual pedigree in the Ford administration. "Never once, until he left the White House," Hartmann has written, "were there more new Ford faces than there were old Nixon faces." But Rumsfeld, who began to be known by the staff as "a smiling Haldeman" (referring to H. R. Haldeman, Nixon's chief of staff), was more crafty than most. He had served four terms as a congressman from Illinois and had compiled a voting record indistinguishable from Ford's. Fortunate at having been away from the wrong spot at the right time as ambassador to NATO during the Watergate trauma, he joined the Ford staff as Haig's replacement. After six weeks as chief of staff, Haig was eased out with an appointment as commander of NATO. "Six weeks of poisonous leaks to reporters and private complaints to the president from Hartmann and other Ford loyalists," said Ron Nessen, finally helped to get rid of him and to install Rumsfeld. Rumsfeld's opportunity to reach for the brass ring was supplied by the obvious need to create some order within the chaotic Ford staff. John Osborne, the close "White House watcher" for the New Republic , wrote that Ford was being "served by the weakest staff in recent White House history." Ford's own ineptitude had created the opening for Rumsfeld's machinations. A more polite view is that, as Nessen puts it, he "was too much Mr. Nice Guy." Hartmann, often dyspeptic and, more charitably, an "abusive pragmatist," was convinced that Ford had made the fatal error of opting for continuity by taking over Nixon's people; they became Ford's Praetorian Guard, a "fifth column dedicated to Ford's failure" and to an eventual restoration of the old regime. To them, Ford was merely a caretaker. Having moved to the top so suddenly via the Twenty-fifth Amendment, Ford reached the White House without his own time-tested loyalists. Consequently, the staff was composed of four separate groups that never became unified. The squabbling became endemic; so did news leaks about disorders. At one point, after getting his fill of stories about Kissinger losing his power, Ford pounded his desk and said, "Goddamn it, I don't want any more of this," and threatened "dire consequences" for anyone continuing the practice. This effort also involved getting his own house in order. The "Halloween Massacre" of a few months earlier exposed the disorder within the White House that had continued to plague the designated presidency. If Ford moved to strengthen the image of his administration, he must have been distressed by the Gallup poll that showed his subsequent level of approval dropping from 58 percent to 36 percent. If his move was designed to placate Republican rightists, as nearly every White House observer assumed, then he was hardly more successful. Governor Ronald Reagan of California, who was still not viewed by Ford's people as ready to risk splitting the party by competing for the presidency, responded in a rather majesterial way, "I am certainly not appeased." On 3 November 1975, Rockefeller withdrew his name from the 1976 ticket. The announced realignment left the Nixonians in basic control. Rumsfeld was the new majordomo. Defense Secretary James Schlesinger, whose enemies included Ford and Kissinger, was dropped altogether. Kissinger had apparently helped to push Schlesinger overboard by convincing the president that the secretary of defense had sabotaged the possibility of achieving any new strategic-arms limitations agreement with the Russians at Helsinki the preceding summer. Schlesinger, whose strongest support was from the Republican right, was replaced by Rumsfeld. George Bush, who had been the liaison to the People's Republic of China, took over from William Colby as head of the Central Intelligence Agency (CIA). At a time when controversies were swirling about the role of the agency, Bush's new position was not seen as increasing his attraction for higher office. Among the remaining changes was the downgrading of Henry Kissinger from his dual role as secretary of state and special adviser on national security affairs. The latter post went to Lieutenant General Brent Scowcroft, the intellectual soldier. One objective was to downplay Kissinger's primacy in the area of foreign affairs, but another was to appease conservatives upset by the firing of Schlesinger. Ford's failure to emerge from all this with enhanced presidential stature seemed to leave Rumsfeld the sole potential beneficiary. Indeed, grumbled Hart-mann, "There still was no Ford Administration." That much had been done to reduce Kissinger's real power is doubtful. His authority had grown rather than decreased. Ford's dependence on his secretary of state dismayed White House insiders. Ron Nessen thought Kissinger was a man who had a "lack of commitment to the truth as a matter of morality. Kissinger bent the truth to serve what he believed were worthwhile foreign policy maneuvers." He dominated the president, noted Hartmann, and "monopolized" him, "sharing the news spotlight and sometimes shouldering him offside" on overseas trips. "This President," John Hersey reported on his privileged view of life within 1600 Pennsylvania Avenue, "who had had a minimal exposure to foreign affairs before he came to office, heard, I was told, only one voice, and a mercurial voice it was, Henry Kissinger's. Yes, this was the most alarming thought I had had all week." Not surprisingly, Ford's brief presidency was more notable for the continuation of a Kissingerian view of balance-of-power relationships. With the American role in Vietnam having concluded in 1973 and the final victory of Hanoi bringing the war to its real end by April 1975, one remaining concern was the credibility of United States power. Détente, which had come to mean "openings" to both Beijing and Moscow, existed side by side with schemes on the international chessboard to continue Cold War containment and reaffirm the credibility of American power. There was no reason to suppose that such concerns would interfere with the proper noises that had to be made about arms control and peaceful coexistence. Consequently, Ford's brief presidency at no point deviated from its predetermined global course. An earlier affirmation of continuity was the new president's travels abroad during November 1974. He became the first incumbent American president to visit Japan; he met with the emperor and pledged cooperation on problems of energy and food supplies, and then went on to Korea and Vladivostok. At that Far Eastern Soviet outpost, he met with General Secretary Leonid Brezhnev, and there was a surprising agreement, the groundwork for which had been laid in October during Kissinger's talks with Brezhnev. Both leaders agreed in principle to limit the overall total of nuclear-warhead carriers permitted each country to 2,400 and the total of missiles equipped with multiple nuclear warheads to 1,320. The secretary of state hailed it as a "breakthrough" that had placed a cap "on the arms race for a period of 10 years." When Ford returned to Washington, he explained that what he and Brezhnev had agreed upon was "the general framework for a new agreement that will last through 1985." All this produced some optimism for reviving the stalled second round of SALT talks, but nothing came of it before the end of Ford's administration. More bitter was the culmination of the final Communist offensive in South Vietnam. On 29 March 1975 came the last refugee flight out of Da Nang. That was followed in Washington by Ford's version of Nixon's clash with Congress over support for administration goals in Southeast Asia. On 10 April, Ford asked for $722 million in emergency military aid and for $250 million in economic and humanitarian assistance to South Vietnam. But, even as he spoke, the Cambodian capital of Phnom Penh was being taken over by the Communist Khmer Rouge forces, and South Vietnam's final capitulation came on 30 April. Ford never did get his requests. Not only did Congress refuse to act, but the mood on Capitol Hill was turning bitterly against Kissinger, the celebrated diplomat who so recently could do no wrong, and revived talk about Ford's need to disassociate himself from that particular Nixon holdover. Administration policies had to be more clearly identified as Ford's. Not surprisingly, Ford's popular approval, shattered in the wake of the pardon, now hovered in the area of 40 percent. Disillusionment, even confusion and frustration, was the order of the day. It could hardly have been otherwise after Vietnam, Watergate, and the pardon coming from the man commissioned to do the healing. Because of Seymour Hersh's account in the New York Times in December 1974, Americans had heard about intelligence activities having gotten out of hand. They read about the CIA having launched "a massive, illegal domestic intelligence operation during the Nixon administration against the antiwar movement and other dissident groups." The needs of "national security" had been used to justify illegal "break-ins, wiretapping and surreptitious interception of mail." All this followed, by just a few months, revelations about how the CIA had worked to overthrow the Chilean government of President Salvador Allende. As if that were not enough, on 28 February 1975 the television newsman Daniel Schorr, leaking information from a congressional investigation committee's report, said that the CIA's activities had included assassination attempts against at least three foreign leaders. Several investigations followed these revelations. The first was a special commission chaired by Vice President Rockefeller to study Hersh's allegations. The Rockefeller findings, issued in June, confirmed illegal CIA activities but minimized the wrongdoing. The report did more to arouse than to quell skepticism.